Home brew can be made from bread, from rye flour. For the first variant of the drink, you can use leftover bread, adding yeast, water, sugar. The second recipe – yeast-free drink on sourdough. Home brew is an all – natural product, cooked with love by diligent hands of Housewives. Besides, this drink is cheaper than store-bought counterpart. Another compelling argument in favor of making home brew is a great way of the use of surplus grain. 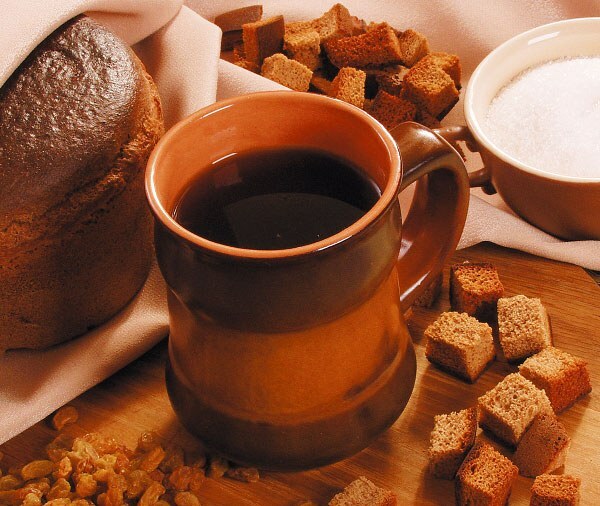 Do not throw away the remains of the black bread, it is possible to prepare the perfect drink. It is best to use Borodinskiy, but other rye varieties. If you use just "molasses", it is first necessary to clean off his crust, which contains coriander seeds. Now the bread should be cut into slices thick 1 cm and dry it in the oven or in a dry frying pan, stirring occasionally. In the latter case, the width of the slices is small – 1.5-2 see the Crackers have lightly browned. Next, the prepared bread filled with five liters is cooled to 40° boiled water. Here vsypaya sugar and pour the yeast dissolved in 100 grams of water. All gently stirred. It is important not to cook the brew in an aluminum pot, only glass or enameled pan. After all the ingredients added, the pan covered with a lid and put to ferment in a warm place for 2 days. After this time, the drink is filtered. Pour 1-2 liter bottles, put one in every 3-6 raisins and put into the fridge. After 12 hours the brew can be tasted. Some fans of the popular drink discourages industrial smell that accompanies homemade kvass, cooked on the yeast. So you can use the ancient recipe of kvass is made from rye flour, in which the ingredient is missing. All the components are mixed and the mass is put on 2 days in a warm place for fermentation. The leaven is ready. Now you can cook with her rye kvass. After this time the mixture was stirred, pour another 2 tablespoons of sugar and the same of rye flour. All thoroughly mixed and poured three liters of boiled water, cooled down to 40°. The solution is put in a warm place. After 3 days the kvass is made from rye flour ready. He carefully poured the liquid, cool it and drink a refreshing drink. Density does not pour out – it will be the starter for the next brew. It fed, again adding 2 tablespoons of rye flour and sugar, topped up with three liters of water. Thanks to its yeast, you can do drink many times, cosipa into it the sugar, flour, and adding 3 liters of water.